August 22 2017, 9:05 p.m.
Donald Trump is threatening to withhold grants from local police if California becomes a “sanctuary state” — but some immigration advocates oppose the grants altogether. The California legislature is poised to enact Senate Bill 54, a state proposal that is the strongest legislative effort yet to enshrine sanctuary protection in the state by curbing local law enforcement cooperation with federal immigration officials. But the Trump administration has threatened that if California passes the act, the state will be cut off from a range of law enforcement grant money. California Democrats, meanwhile, have declared that any move to cut off the spigot of federal policing funds is an attempt at blackmailing the state, and are promising to fight for every dollar. Lost in the conversation, however, is a question few have raised, let alone answered: Is the federal money necessary for public safety? SCAAP provides reimbursements to local jails. 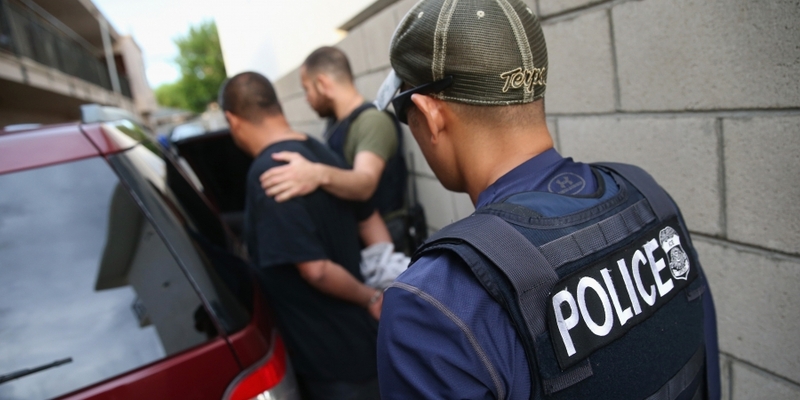 The money allows municipalities to partially bill the federal government when detaining immigrants — specifically those in the country without legal authorization, who have been previously convicted of at least one felony or two misdemeanors. In exchange, local authorities must inform Immigration and Custom Enforcement officials of potentially removable individuals. The funds cover pre-trial and post-conviction costs of detention for state-level offenses, unrelated to federal immigration charges. While the program, which dispersed over $50 million to California county sheriffs in the 2016 fiscal year, the most of any state, has been portrayed as a necessary program for law enforcement, some experts are skeptical. Angela Chan, an attorney and policy director with Asian Americans Advancing Justice – Asian Law Caucus, said that the stream of money to county sheriffs meant that state law enforcement was effectively profiteering from ICE. In other words, the program encourages local law enforcement to arrest and detain immigrants without legal authorization to be in the country. The federal government will only provide reimbursements — which become de facto extra funding — only for detaining those people. Immigration and Customs Enforcement agents frisk a detained immigrant at a processing center in Camarillo, California on Oct. 14, 2015. In a research paper studying SCAAP, legal scholar Anjana Malhotra argued that the program has become an integral part of immigration enforcement’s machinery because it enlists “untrained state and local law enforcement officials throughout the country as a front line for criminal and civil enforcement of immigration laws.” Local law enforcement agencies questioned and referred some 1.65 million suspects under the federal reimbursement program over a five-year period, Malhotra found. Malhotra also called attention to a number of ways SCAAP encourages fraudulent billing requests and provides incentives for questionable correctional tactics. A 2012 California state auditor report found nearly 2,000 faulty alien records submitted through SCAAP, in addition to several attempts to bill the government for the detention of legal permanent residents. In New Jersey, as part of an effort to seek reimbursement funds under the program, correctional officers in Morris County waived Miranda rights and forced individuals under detention to disclose their immigration status or face solitary confinement. Who Gets The Most Money From The Feds? Many California sheriffs oppose SB 54, which they claim is dangerous because it might hinder their ability to remove violent offenders who don’t have authorization to be in the country. Some of the sheriffs, however, also concede that their advocacy is motivated by money. Kings County Sheriff Dave Robinson has called attention to SCAAP funding when speaking to local media about his opposition to the sanctuary state legislation. So has Orange County Sheriff Sandra Hutchens, who made the potential loss of SCAAP money a major talking point as she lobbied state officials against enacting SB 54. “This program provides significant funding that helps my department and others across California mitigate the impact of undocumented offenders,” Hutchens wrote. That local governments have come to count on federal immigration cash is evident in how how counties across the state have ramped up the fight to maintain the funds. Disclosures show that at least 11 California county governments retained D.C. lobbyists to continue the flow of SCAAP money. Even the California Senate, which has led the fight for sanctuary state legislation, has retained federal lobbyists to work on keeping SCAAP for the state. Other law enforcement grant programs have also been raised in public discourse over sanctuary city policies. The Edward Byrne Memorial Justice Assistance Grant Program, known as the JAG grant, is another major federal grant program at stake over the sanctuary state law. In July, Attorney General Jeff Sessions threatened to revoke JAG funding over sanctuary protection laws. And last week, California Attorney General Xavier Becerra and San Francisco City Attorney Dennis Herrera filed suit to block the Trump administration’s efforts to restrict federal grant funding over sanctuary policies, singling out JAG money. Yet again, lost in the media coverage of the back and forth, is the long history of JAG grants in fueling drug war policies and mass incarceration, just the sort of policy outcomes decried across the ideological spectrum. The program broadly funds a range of criminal justice work, including corrections, treatment, and victim programs — but the majority of funding has historically gone to traditional law enforcement programs, some of which are associated with aggressive policing tactics. JAG money purchases lethal weapons, drones, riot gear, and other equipment that has fueled the militarization of police. Local agencies have also routinely used JAG grants to focus law enforcement resources on marijuana raids. This funding, critics say, creates another layer of financial incentives for maintaining the size and scope of heavy-handed policing. The JAG program has been assailed as counterproductive in recent years from a broad array of advocacy organizations, including the Brennan Center for Justice on the left, and the Texas Public Policy Foundation on the right. The courts may end up blocking the Trump administration from making good on its threats to revoke federal funding, irrespective of whether SB 54 passes. But to legislators mulling the proposal — the bill passed the state Senate in April and is now under consideration in the California Assembly — the federal funding remains for the moment a factor. Factoring in a notoriously unpredictable administration has created another wrinkle in the debate. While Sessions dangles the potential loss of SCAAP and JAG funds to pressure California, the administration budget slashes many of the law enforcement programs, including JAG, and calls for eliminating SCAAP entirely. If the law enforcement grants are continued by Congress, then pulled from California to punish the state over sanctuary protections, could that still be considered a victory for immigration and criminal justice reform advocates? 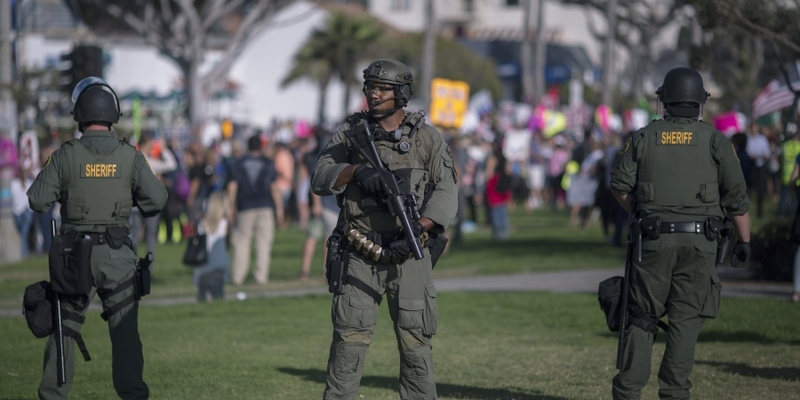 Top photo: Sheriff deputies form a line to keep demonstrators and counter-demonstrators apart during an “America first” demonstration in Laguna Beach, California, on Aug. 20, 2017. August 23 2017, 6:43 p.m. Earlier this year, Sacramento County Sheriff Scott Jones invited Immigrations and Custom Enforcement chief Thomas Homan to a community forum. The event was advertised to the public as an opportunity to clear up misinformation around the immigration debate. In private, however, Jones confided over email to Homan and other ICE officials that he wanted to use the event help to derail Senate Bill 54, legislation proposed to create so-called “sanctuary state” protections in California. President Donald Trump’s assault on so-called sanctuary cities — municipalities that, to varying degrees, refuse to cooperate with federal immigration authorities — has included threats to cut off federal funding streams. Among these grant programs are several that give financial support to local law enforcement agencies. While it’s not clear what effect cutting these programs would have on public safety, they have become a flashpoint in the debate over local and, in the case of California, statewide efforts to create sanctuaries for immigrants who are in the country without legal authorization. The Trump administration has a relatively small political foothold in California; Democrats control all statewide elected offices and hold a supermajority in the state legislature. Yet the California State Sheriffs’ Association has spearheaded the effort to defeat SB 54. All but one of California’s elected county sheriffs have mounted a robust lobbying effort, deploying considerable advocacy resources along with a media campaign closely coordinated with the Trump administration. The sheriffs’ bare-knuckle advocacy efforts are detailed in emails obtained by The Intercept through California Public Records Act requests. The current head of the CSSA, William Brown, who also serves as the sheriff of Santa Barbara County, has taken a lead role in public as the voice of opposition to SB 54. Behind the scenes, Brown has moved aggressively to court opposition to SB 54. Emails show that should the bill pass, law enforcement may ally with far-right forces to place a ballot initiative to roll back the protections. In February, Brown corresponded about such an initiative with Ted Hilton, an anti-immigration activist who has claimed in the past that giving unauthorized immigrants a legal path to citizenship would make the U.S. like a “Third World country.” Draft language of the ballot initiative would give ICE wide latitude in processing any undocumented individual arrested by local police. “This is the best political climate to move forward on this type of measure with advocacy from the Trump administration,” Hilton said. His email was forwarded to Brown by an assistant, who confirmed over email that the two would hold an in-person meeting. Hilton also claimed that he had secured assurance from Rep. Darrell Issa, R-Calif., that the campaign to push a ballot initiative forward could make use of the congressman’s voter lists. Along with other sheriffs, Brown raised the issue of the loss of federal funding, a threat that the Trump administration has made to any jurisdiction with sanctuary policies. In a letter to Assemblymember Monique Limón, whom political observers see as a swing Democrat on a variety of contentious issues, he stressed the danger of losing “vital federal funding” with passage of the bill. Sacramento lobbying firm Warner, Pank, Salzillo & Sanchez, which helped the sheriffs mobilize for news conferences and approaching legislators, also maintains a close watch on the tactics of their opposition. A note from John Robertson, the Napa County sheriff, alerted fellow sheriffs that the American Civil Liberties Union could be setting traps around SB 54. The message, shared by Cory Salzillo, a Warner lobbyist for the CSSA, suggested that the ACLU was using invitations to forums about the bill as a way to ambush sheriffs with hostile media. The lobby firm corresponded with the office of Republican Assemblymember Travis Allen on its sanctuary strategy. Allen, notably, is running for governor, and has cited opposition to sanctuary policies as a major issue in his campaign. Orange County Sheriff Sandra Hutchens speaks during a news conference at Orange County Sheriff’s Department headquarters in Santa Ana, Calif. on Wednesday, June 28, 2017. The sheriffs have also taken to conservative media to broadcast their message, appearing on talk radio and cable news to warn that SB 54 will lead to undocumented immigrants terrorizing communities. During her appearance, Hutchens and Carlson went through the usual litany of points against the bill, raising the specter of dangerous immigrants released from local jails and noting that if sheriffs can’t cooperate with ICE, immigration officials would raid local communities, potentially exacerbating tensions. The political dynamics appear to favor proponents of the sanctuary state bill; it has robust backing from nearly every high-profile Democrat in the state, buoyed by growing interest in opposing Trump’s deportation agenda. But the California sheriffs have a long history of political victories. Last year, they successfully lobbied to defeat a state ballot initiative, Prop 62, to end the death penalty, while helping to pass a dueling initiative, Prop 66, that sped up the death penalty process. It was a stunning victory for law enforcement, despite being vastly outspent by death penalty opponents. Top photo: A sheriff’s deputy (R) talks to an immigration detainee (L) in a high-security housing unit at the Theo Lacy Facility, a county jail which also houses immigration detainees arrested by U.S. Immigration and Customs Enforcement in Orange, California, on March 14, 2017.